In my neighborhood, the familiar hubbub of moving vans and trucks is in full swing. Happy and sad people are coming and going for all sorts of reasons, but they all have the one thing in common: new homes to decorate. This PCS season, it’s our turn to stay put, and I am very happy to be right where we are, but I do have a twinge of jealousy because there isn’t a different home to style in my near future. It’s been nearly two years since our arrival, and I can tell because I am ready for a clean slate and to start the decorating process over. As much as I want a windfall of cash to magically appear to inject a fresh style into several rooms of our house, I’ll have to settle with a few updates that make a big impact. Jen McDonald, MilitaryByOwner's Content Editor, has challenged me to come up with some ideas to revamp a room for 100 bucks or less. Here are a few ideas, but take these and run with them because creativity stretches a budget better than anything! Kitchens tend to look outdated faster than any other room of the house, so let’s start there. But keep in mind some projects would work in bathrooms, too. It’s a big job to update and paint kitchen cabinets so embracing the current trend to only paint the lower or upper cabinets will make $100 of paint go further. Just make sure the new color complements the existing cabinets. If your rental home has kitchen counter tops that could use a temporary update, take a look at all of these very inexpensive ways contact paper is transforming outdated surfaces. Rolls of the sticky stuff can be found for $10, but make sure you find an extra supply of patience while shopping; you’re going to need it. While you’re at it, you’ll probably need to borrow an extra set of helping hands. Another eyesore in a kitchen can be a bland or even ugly backsplash. Adding a graphic pattern vinyl covering solution can perk up the space. This project should move quickly for instant gratification if the space is small, as backsplashes typically are. Shop for the perfect shade of spray paint and attack those dated hardware pieces and switch plates found in most rooms in the house. Dressers, cabinets, and even light fixtures get dressed up instantly with a coat of paint. We spend most of our time in our living spaces, so it’s a good idea to keep a few of these suggestions on hand for when inspirations strikes. Mantels are easy to dress up on the cheap. Normally, they are the focal point and can elevate the style of the room instantly. The options are really endless. Using items already in the home (or from your garden or yard) can change a look quickly for a party or a holiday. Flowers, pottery, black and white photography, or a collection of antique wooden cutting boards will all add interest. Artwork that has meaning for your family is easily the best way to distract from any flaws in the house you’re trying to ignore. Grouping two to three larger sized items will fill a lot of unused wall space such as in a prominent foyer or hallway. One idea is to print favorite photographs on stretched canvas. Sizes vary but a couple of 12 x 12s are a good place to start and are inexpensively found at Costco and Shutterfly. 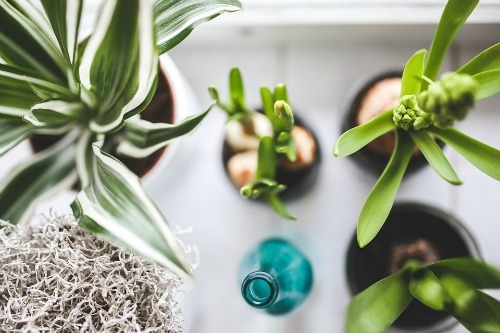 Plants add energy and life to any space, but owners have to be invested in their care. Upkeep might dissuade some, but they certainly can liven an awkward corner or nook. Large, tall potted plants will visually bring high ceilings down for a more intimate feel. Could your front door use an update? Front doors and porches set the tone for what style is found inside. Consider this area a “room” to revamp and it will give you the motivation to progress further into the home. Lowe’s has a helpful tutorial to add the much desired curb appeal. While the door is unhinged, a fun and unexpected option is to paint the inside of your front door a bolder but coordinating color. Jones Design Company’s blog has amazing examples. For more decorating ideas that are free or done on a budget, read over the decorating blogs and resource pages MilitaryByOwner has pulled together for a whole lot of DIY inspiration! How to Throw a Fabulous Holiday Party...So You Enjoy It, Too! Pet-Friendly Home Upgrades: What Are You Willing to Pay For?